During most years, many area farmers put in their spring wheat crop at about the same time that area high schools begin chasing championship dreams at the State B tournament. However, the snow and cold of February has mostly kept tractors out of the field at the same time turbulent market forces remain unresolved. If February weather produced any good news, it was that the snow provided the winter wheat a blanket of insulation from the bitter cold, he said. Dry fall conditions also prevented the winter wheat from getting much of a foot hold before colder temperatures took over. Tom Zwainz said he’s only got his equipment out on some of the ground he farms near Reardan. Normally, farmers are already weeks into planting the spring wheat or spraying the winter wheat that was planted last year. 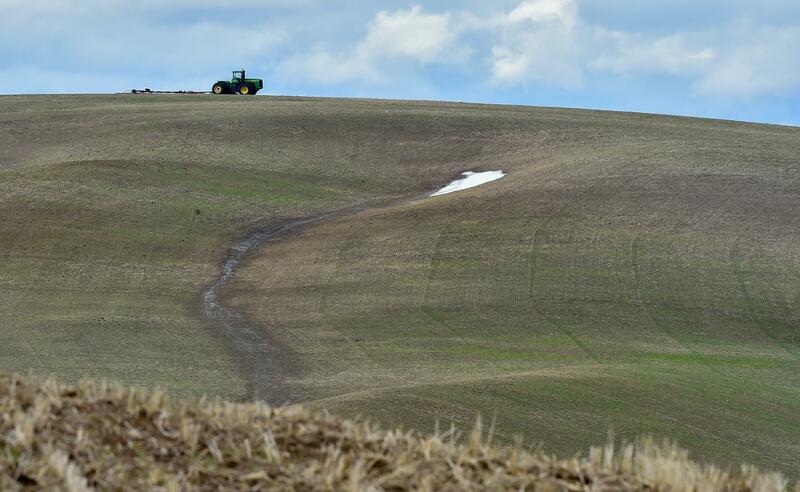 While the cold has stunted winter wheat growth, the snow did add some needed moisture to the ground, both farmers said. However, in several places south of Ritzville, the snow melted before the ground thawed. That caused the water to quickly run off, which washed out a road, but did little to saturate the soil, Miller said. Many of the same market uncertainties that rocked the agriculture world last year remain in place, said Miller, a member of the Washington Grain Commission and former chairman of U.S. Wheat Associates. U.S. officials have a verbal agreement to replace the North American Free Trade Agreement with Mexico and Canada, but nothing has been ratified. Talks have been ongoing with China without resolution and the United States has no new agreements to replace those vacated when President Donald Trump pulled out of the Trans-Pacific Partnership, which includes several important wheat customers for the Pacific Northwest. Bad news for other wheat producers tends to ease financial tensions in Washington. For instance, a massive drought in Australia could have a positive impact for local farmers. The economic situation would improve if the U.S. could solidify an agreement with Japan, which is one of the leading importers of Washington wheat. “That could be a really bad thing if we don’t get an agreement with Japan this year,” Miller said.